Product prices and availability are accurate as of 2019-03-12 19:22:21 EDT and are subject to change. Any price and availability information displayed on http://www.amazon.com/ at the time of purchase will apply to the purchase of this product. Letters from Paris is the name of this 12 by 12-inch paper from Dove of the East's Paris Vintage collection. From the banks of the River Seine to the top of the Eiffel Tour, Paris is blooming with romance. Stop in a café to dream away the afternoon and write a love letter or stroll through the streets and gardens and fall in love with the city, a bewitching lover that will never leave you. 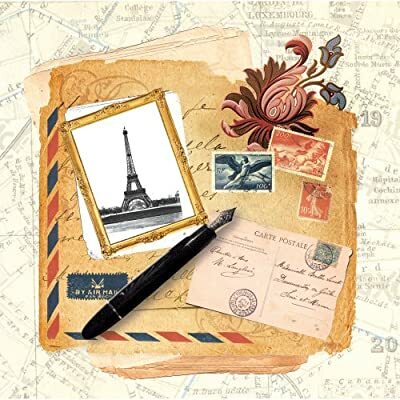 Enjoy Paris Vintage papers in your scrapbooking, stamping, card making, altered books, crafts and other artistic projects. Letters from Paris is a collage of a fountain ppen, old postcards and letters on a background map of Paris. Use it as a background or tear, cut, stamp or glue this acid-free paper. Dove of the East papers feel thick and smooth, almost like card stock and tear easily with a white core. Trim off the white logo banner to get a 12 by 12-inch sheet and get started making cards, scrapbook pages and more. Let your imagination take flight.